Tin coated steel strips are primarily used to make beverage, aerosol, industrial and decorative type cans and containers. The tin is typically electro-plated onto the steel strip. After the tin is applied, the tinplated strip is continuously passed through an induction heating coil where the strip is heated to melt and reflow the tin. Upon solidifying, the coating produces a thin iron-tin alloy layer at the interface, with a bright mirror-like finish which suppresses any porosity of the coating. In such a system a large amount of power is concentrated in a relatively short length of traveling strip, and proper heating is dependent upon maintaining the relationship between the volume of the material passing through the induction heating coil and the power input provided. Ajax TOCCO supplied the very first system in 1942 and has more than 50 installations since this date. 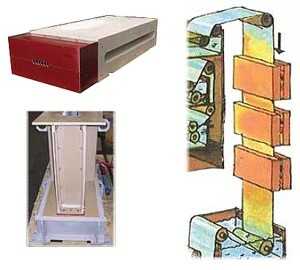 The original units used large vacuum tubes to generate the frequencies needed for thin gauges. Now, the availability of solid state devices makes these systems state-of-the-art. Whether new or upgrading an existing installation, Ajax TOCCO has the equipment, experience and technology our customers require. Original Equipment Manufacturer (OEM) providing service and support for Westinghouse Induction Tin Reflow Systems.